The Let Me Entertain You singer, who is expecting a baby girl with wife Ayda Field, posted a picture of the album cover on his website. The blue cover features the star's head cast in gold underneath the title. According to Robbie's website, his latest offering is due to be released on November 5. The 38-year-old is also due to play three intimate gigs as he prepares to release Take The Crown, which will be his ninth solo album. The former Take That star will perform at Leeds Academy, Glasgow Barrowland and Southend Cliffs Pavilion in September - venues he first played as a solo artist 15 years ago. 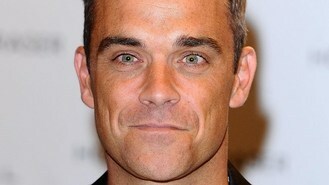 Robbie released his last studio album Reality Killed The Video Star in 2009.